Pronounced [sih-LAHN-troh] this member of the carrot family is also referred to as Chinese Parsley and Coriander. It is actually the leaves (and stems) of the Coriander plant. 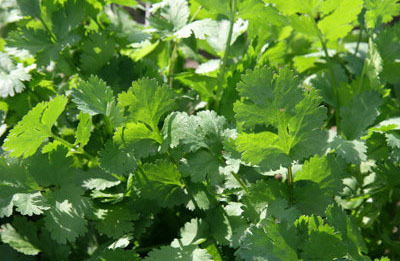 Cilantro has a very pungent odor and is widely used in Mexican, Caribbean and Asian cooking. The Cilantro leaves look a bit like flat Italian parsley and in fact are related. Coriander grows wild in South East Europe and had been cultivated in Egypt, India and China for thousands of years. It is mentioned in Sanskrit text and the Bible Spanish conquistadors introduced it to Mexico and Peru where it now commonly paired with chilies in the local cuisine. It has since become very popular in the Southwest and Western part of the United States as well as in most metropolitan areas. An interesting note is that people of European descent frequently are reviled by the smell of cilantro. It has not gained in popularity in Europe as it has in many other parts of the world.